Please click "Yes" or "No" for each question below. The form will automatically calculate your score at the bottom. I have fallen in the last 6 months. Why it matters: people who have fallen once are likely to fall again. I use or have been advised to use a cane or a walker to get around safely. Why it matters: people who have been advised to use a cane or a walker may already be more likely to fall. Sometimes I feel unsteady when I am walking. Why it matters: unsteadiness or needing support while walking are signs of poor balance. I steady myself by holding onto furniture when walking at home. Why it matters: this is also a sign of poor balance. I am worried about falling. Why it matters: people who are worried about falling are more likely to fall. I need to push with my hands to stand up from a chair. Why it matters: this is a sign of weak leg muscles, a major reason for falling. I have some trouble stepping up onto a curb. Why it matters: this is also a sign of weak leg muscles. I often have to rush to the toilet. Why it matters: rushing to the bathroom, especially at night, increases your chance of falling. I have lost some feeling in my feet. Why it matters: numbness in your feet can cause stumbles and lead to falls. I take medicine to help me sleep or improve my mood. Why it matters: these medicines can sometimes increase your chances of falling. I often feel sad or depressed. Why it matters: symptoms of depression, such as not feeling well or feeling slowed down, are linked to falls. We collect the following information for statistics only. Your total score is displayed below this paragraph. If you scored 4 points or more, you maybe at risk for falling. We recommend that you print out this form and discuss it with your healthcare provider. 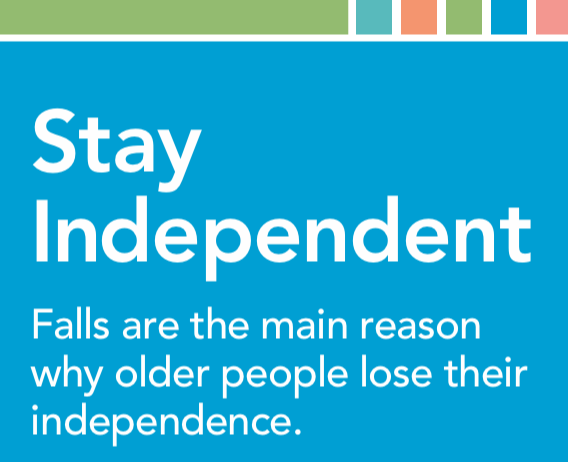 Falls are the main reason why people lose their independence. Follow this link to download an informative brochure on how to prevent falls: brochure.